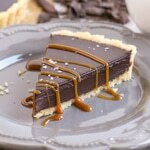 Looking for more Chocolate Recipes?? NOTE: This recipe uses raw eggs which may be an issue for some. You can use pasteurized if you prefer. Raw eggs should not be consumed by pregnant women, small children, or anyone with health issues. 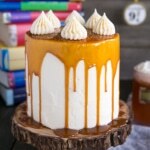 Would it be possible to make the frosting with white chocolate? If so, do you think decorating the cake with half white and half regular frosting could work, or would the tastes clash? Hi there! I don’t see why not, I think flavour-wise they would go fine! Although now that I say that, it’s possible the frosting would be softer using white chocolate. 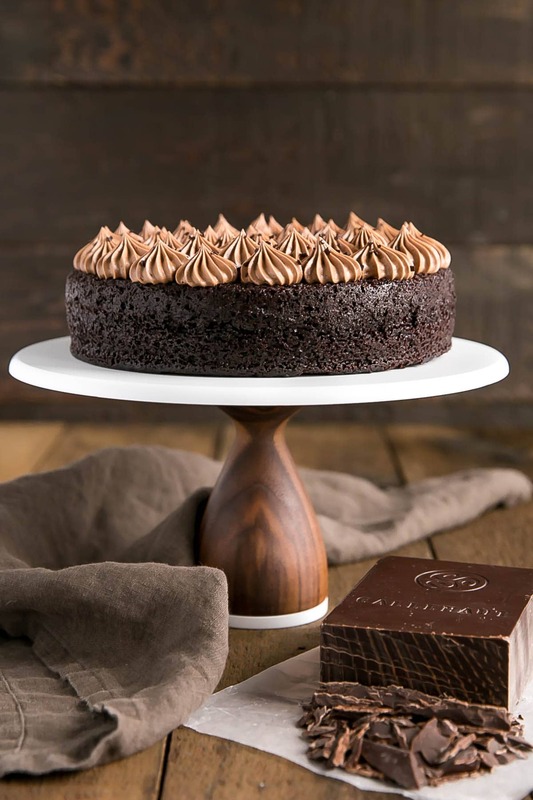 Just wondering if a rectanglular pan used for a sheet cake can be used instead of the round cake pans. This cake was amazing. Probably the best chocolate cake I’ve ever had. This was my first cake from this site and I’ll definitely be back to try more. Icing was a bit time consuming but oh so tasty! Hi Moira! So happy to hear that you liked it, I can’t wait to hear what you try next! LOVE that icing, it’s a fave. Super excited to try this for my Father’s birthday in a few weeks! McCain chocolate cakes are his absolute favorite & are all he ever wants! You find the icing to be the same (or just about)? That’s what he likes the best. Would you say it would be ok to make the day before (both cake & icing) amd keep in the fridge? Hi Amy! I found the frosting to be very close. It’s not identical since it’s homemade and all, but it was SO good. Be sure to take the time to make it though, and really whip those eggs in. Totally fine to make it the day before! If you’re decorating it the same way I did, be sure to chill each layer separately and then stack once the frosting has firmed up a bit. Opps! i bought semi sweet bakers chocolate instead of unsweetened. Thoughts? I want to get it as close to the deep & delicious as possible – so if I have to go buy unsweetened that’s ok. Just wondered your thoughts! Semi-sweet should be fine, it’s what I would use next time! can the eggs be left out not keen on raw eggs. This is the best recipe for both cake and frosting I’ve ever made. My husband didn’t believe I made it from scratch. One word of caution: if you make this cake it is addictive. Haha, I hear you! So happy to hear you both liked it. That frosting is still one of my faves! Hi Olivia, I was so excited to try this recipe and did actually try it but forgot the oil in the cake batter. 😣 Now my cakes are in the oven and I have no clue what they will be like atlfter coming out. Hi Maddy! Ugh, that is the worst. How did they turn out?? Hello there! 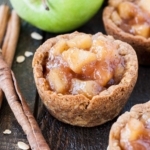 This recipe looks great and I will definitely try it some time. But what I am looking for right now is vanilla mc cain cake icing. My daughters b day is coming and the vanilla ones are her favorite. The icing is really different than other vanilla icings. Do you have any ideas for me? I would really appreciate some help. Hi Alex! I’ve actually never had the vanilla one so I can’t speculate as to what it’s like. I suppose you could try leaving the chocolate out of this one, but not sure if that’s the best strategy. 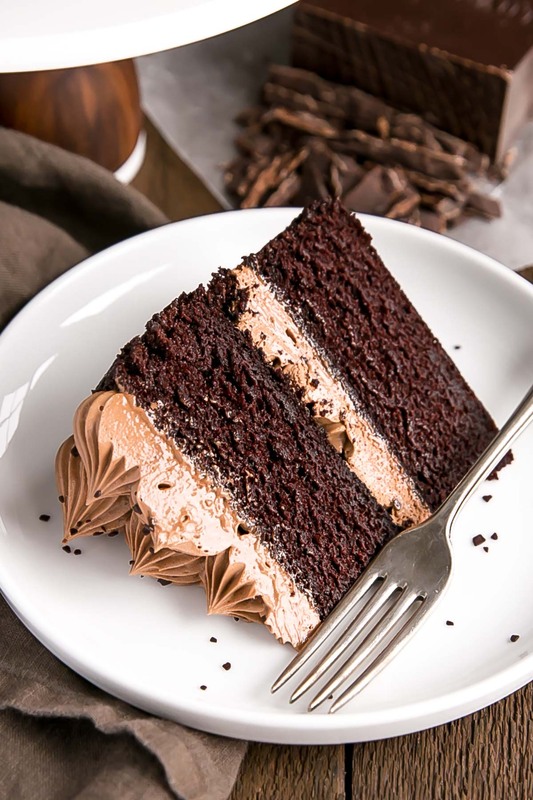 Cant wait to try out your recipe tomorrow for a friend who has not eaten mccain chocolate cake in years now, because we live in the Netherlands in Europe and it is not available here. I have never had mccain chocolate cake, so I have no idea what it should taste like.. I want to surprise her with it and hope it will take her back in time to when she still lived in Aruba and used to buy this cake often because she loves it so much. I was wondering if you have made this recipe before with homemade buttermilk, and if so, did you use fresh lemon juice or from a squeeze bottle? I can go out and buy fresh buttermilk tomorrow, but im afraid our buttermilk looks a bit thin compared to the thick buttermilk I see in American videos.. ours is almost as thin as regular milk. Hi Aike! I almost always use homemade buttermilk as I never want to buy a whole carton of it! It will work just fine 🙂 I add 1 Tbsp lemon juice (squeeze bottle) to 1 cup milk (I use 1% because that’s what’s in my fridge, but any works). You can also use vinegar. Let me know how she likes it!! I just pulled my cakes out of the oven and the layers are only 1,5 inches tall. Is that normal? This always happens when I use the hersheys chocolate cake recipe or one that is kind of similar to it too. I thought that was because I use dutched cocoa powder (I am from the Netherlands and us Dutch people are only able to get Dutch process cocoa here) . But in your recipe it was specifically asked for so I thought it would be ok this time. I used store bought buttermilk and Im wondering if perhaps that might not be acidic enough to react with the baking soda? Or perhaps our flour is different.. American flour is made from hard wheat and hours is made from soft wheat, but I made sure to buy one that has the same protein content as american all purpose flour. 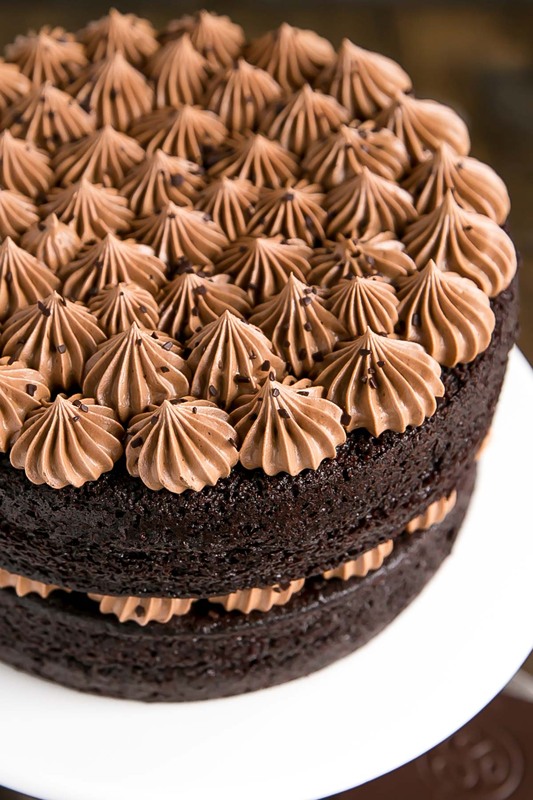 This is so frustrating because I love the flavour of these types of chocolate cake, but I just wish it would bake taller. When its in the oven it seems to rise to a nice height, but eventually when they are still in the oven, they just deflate and shrink. I am not an unexperienced baker and have followed the recipe to a T. Weighed out all of my ingredients exactly in grams. I have joined your facebook group today, I could sent you a picture of the cake layers and hope you can help. A quick google search shows i am not the only one in Europe struggling with this type of chocolate cake falling or just not rising properly. Wish I could get my hands on some american all purpose flour to see if that might work better. Hi Aike! Did you use 8″ pans? If so they should be about 2″ tall. Did you check to make sure your baking soda and baking powder are not expired? Sometimes this can be the culprit. I always only use Dutch cocoa as well. Are you at high elevation by chance? That could cause problems for sure. It’s possible re: flour. I tried to bake a cake at my sister’s in Sydney and it was a total fail — dense and didn’t rise much. I assumed it was the flour. Definitely email me a pic or post in the group! Hmm, that is super strange! Please let me know if you figure it out, I’m curious! Try making your own buttermilk with 1 cup milk +1 tbsp lemon juice. I like to combine them and let it sit to get thick while I get other ingredients ready. Also, I add just a pinch extra baking soda because I like very light fluffy cake, and try lowering your oven. Cake baked at 300 or 325 F (150C – 165C or gas mark 2 or 3) will often rise higher than cake baked at higher temperatures, but you will need to adjust cooking time accordingly. my daughter lives in the UK. the flour definitely has a different texture. I cannot get my cinnamon rolls to rise very well either. I am not sure how to fix the problem but I do feel that the difference in flour texture is the culprit. Ugh, good to know. Have you tried different kinds/brands of flour over there? YOU COULD TELL ME, WHAT DOES THE CAKE MEASURE OF HIGH FOR 12 PEOPLE? I made this for a surprise party I was attending at the request of the person throwing the party. I asked what kind of cake the bday girl (70 yrs old bday girl 😊) and was told nothing chocolate. This cake was a HUGE hit with everyone, especially the bday girl. Many people said it was the best chocolate cake they ever had. I doubled the recipe and made a 12 inch cake. It was perfection. Oh typos!! Sorry about that – I was told anything chocolate, not nothing chocolate. I just was reading about you. OMG!!! You grew up in Edmonton, which is where I grew up and lived for 50 years of my life. I now live in Newfoundland. We are almost neighbors! I love to know a bit about you.It is so nice to see the pictures you posted and I feel like we have so much in common. Small world!! And wow, that is quite the move after so many years! Ryan and I talk about visiting the East coast often. Need to get out there. You are amazing! Just wanted to let you know, even when I don’t look at the author of the recipes I look at , I can usually pick yours out, just by how well written instructions there are and everything else. 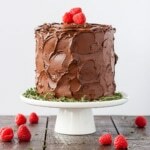 I am making this cake tomorrow, but will be using 3- 6’pans, and would like to use a white frosting on it for contrast. Could you suggest one that will work well with it? And I am pretty sure I don’t have to adjust much of the ingredients? I hope you can let me know your thought on this. Aww thanks so much Carol! You are the sweetest! 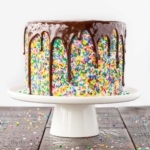 The cake should work fine in three 6″ pans, though there’s a chance it could spill over a bit, so maybe just put a baking sheet under the pans just in case. Don’t fill the pans more than 1/2 full as the batter rises a LOT. And I actually think a simple whipped cream would go really well. That way the texture is close to the chocolate frosting. Anything else might be a bit on the heavy side. Love the idea of something simple, like whipped cream. 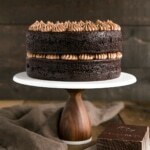 Sounds perfect.Making this beautiful cake today, can hardly wait. A gray day here, hopefully we do not get more snow, did you hear that we had around 35cm last week? Just got rid of that, and it is raining so much,so now there is a chance certain places here will get more snow. But otherwise it has been a great spring. I hope you come here sometime, it is worth it. Thanks so much! Have a lovely day! This looks divine! The baking imp is beckoning and now I’m scheming with that frosting in mind. I wanted to ask if you ever use, in lieu of water, strong, fresh black coffee? I have a recipe that’s similar to this from Ina Garten that calls for coffee and it’s quite de-lish. What are your thoughts? Hi Angie! I have used coffee in this recipe in the past, but I like it better with water myself. I find that it’s a bit less bitter, but also I’m SUPER lazy and it’s easier to boil water than make coffee. The frosting is to-die-for. I hope you try it! 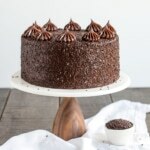 Is there any particular reason for the difference between vanilla base cake and this chocolate base one? I’ve notice for your cakes that have a vanilla base, you cream the butter and sugar, incorporate the eggs, then add the flour, whereas with this chocolate base there is extra hot water and you combine all the dry and wet ingredients separately before finally combining them all. Hi Arden! 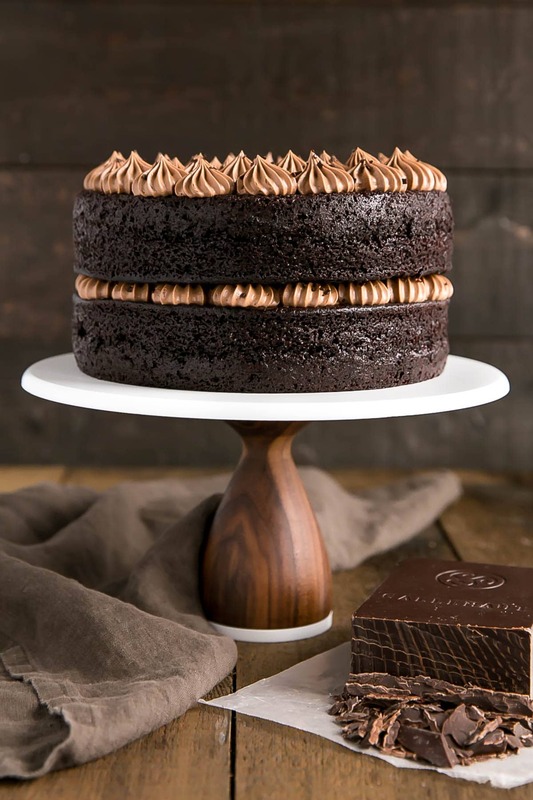 The vanilla and chocolate cakes just use different formulas and mixing techniques. I keep meaning to try a vanilla cake using the hot water method and replacing the cocoa with more flour, but I haven’t gotten around to it. Hi 😊 The French silk frosting tastes great; but it seems like it has split. It also seems to be a bit grainy even though I beat 5 minutes exactly(!) between each egg. Would perhaps not beating sugar and butter enough cause this? I did use a 70% chocolate infused with coffee. So it had tiny grains of coffee powder in it. I don’t know if that would cause any such trouble. Hi Gunn! Yes, the excessive whipping is to help ensure the sugar is completely dissolved. The coffee powder could have affected the texture as well. What do you mean that it seems like it has split? Hi, Can buttermilk be replaced with any other ingredient? Ideally not as the acid in it is required for the leaveners. If you don’t have access to buttermilk you can easily make your own — 1 cup milk + 1 Tbsp lemon juice! 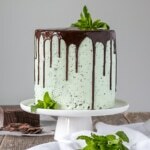 Making 2 9 inch cakes instead of 8, what would you suggest to increase the recipe to? Hi Tari! Ideally you would increase it by 1/3 but that would give some weird amounts. I would suggest 1.5x the recipe and make cupcakes with any extra batter. The layers rise a lot so be sure to not fill the pans more than half full. I hope that helps! Looks great! Can I freeze this cake and for how long? Can I freeze the frosting while in the cake? I plan on making the cake and putting frosting between layers then when ready taking out of freezer, frost it and then decorate. Hi Maria! I would freeze the cake layers themselves and then make the frosting the day you plan to serve it for best results. Apaixonate, estou aqui agora traduzindo a receita para tentar reproduzi-lo. Parabéns e obrigada querida por receitas e bolos maravilhosos. -did you refrigerate the mousse covered (would it “drying out” in the fridge work better?) before piping? – how long do you whip when you rewhip every 10 minutes of fridge time (is it 5 minutes each time)? – I had small chunks of chocolate that had solidified from the cooled melted chocolate. Would that have deflated the mousse and made it difficult to form stiffer peaks? The overall flavor of both the mousse and the chocolate is excellent. I’d really like to be able to pipe nice stars though for my next cake. Before I frosted the cake, I only refrigerated the mousse for a total of 30mins (rewhipping for less than 1 min, every 10mins). It might take a bit longer depending on how warm your kitchen was, etc. but it should eventually get quite stiff. I did not cover the mousse at any point. For the chocolate chunks, at what point did that happen? I made sure to scrape the bowl often so I didn’t have any stray pieces of chocolate anywhere. Hi! The chocolate pieces could have come from the difference in temperature when oh mixed in the cold ingredients into the chocolate mixture. If a lot of the chocolate got cold and formed into pieces there was less chocolate mixed into the mousse and that could explain why it didn’t properly set. Hi There! I’m in the process of whipping the filling/frosting after every 10 minutes of refrigeration. How long should I whip it for each time. 5 minutes again? I’ve been doing 3 and then putting it back in the fridge. My cakes are still warm so I think the mousse should have plenty of time to chill and set up before piping. I was planning on doing the every-ten-minute-whip for the first half hour and then letting it just sit until the cakes are completely cool. Before piping I thought I could give it one final whip. Does that sound about right? Thanks! Found you via Pinterest and I must say I’m already in love with your baking without even trying a single recipe. I’m sure all recipes must be “no fail” by the way you write about it. I’m going to try this Cake for sure. Just want to know wether I can ‘simply do half of each ingredient’ to make only one pan of cake? Will you suggest this method or any other? Thanks so much Amit! That’s such a sweet comment. You can totally halve the recipe to make one layer, but it might be tricky for the frosting since it uses 3 eggs. Do you have a scale? If so, I would just lightly whisk one of the eggs and weigh out 25g to get half. I hope you like it! Thank you very much. I will do as you said and post my results. Hi there! It’s neither actually. It’s too dense to be a chiffon and contains oil instead of butter. It’s more of a rich, brownie-like, mud cake. Hi Olivia! 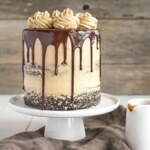 Just wandering, what is the difference between this cake recipe and the one in you chocolate chip cookie dough cake recipe? Thank you in advance! Hi Amarantina! Not much, just some of the proportions are different so it would work better in the 8″ pans. Why does the total time say 1 day, 8 hours, 35 minutes? Hi Barbara! It was an error in the time calculation. Beautiful cake!!! Does cake need to stay refrigerated ? If this cake sets out to room temperature will the frosting lose it’s shape and become runny? I usually let my cakes get to room temp before serving(I thinks they’re moister this way). Thanks. Hi Anne! You should refrigerate it to set the frosting, but after that it should be ok out for a couple hours. I would not leave it out for extended periods of time though. Is the cake recipe part the same as in your Black Forest cake? 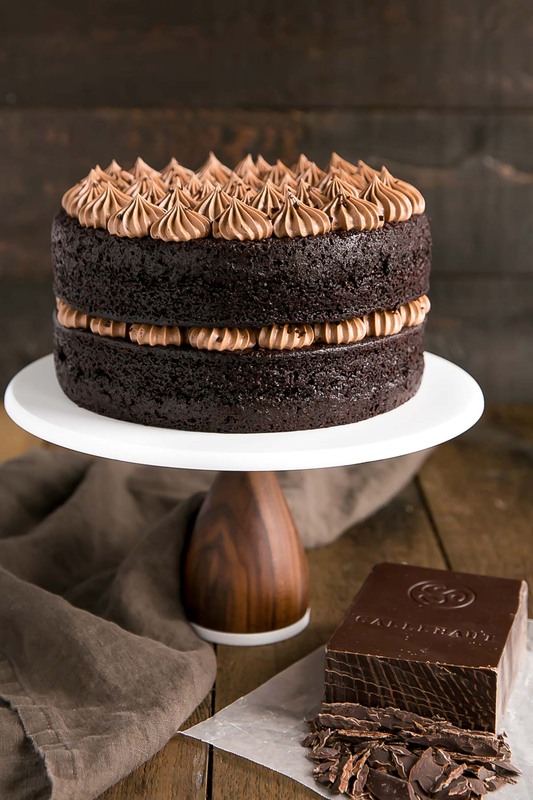 I’m planning to make a Black Forest cake next week for my birthday, and while I have a chocolate cake recipe that I usually use, I’m on the lookout for a better one. 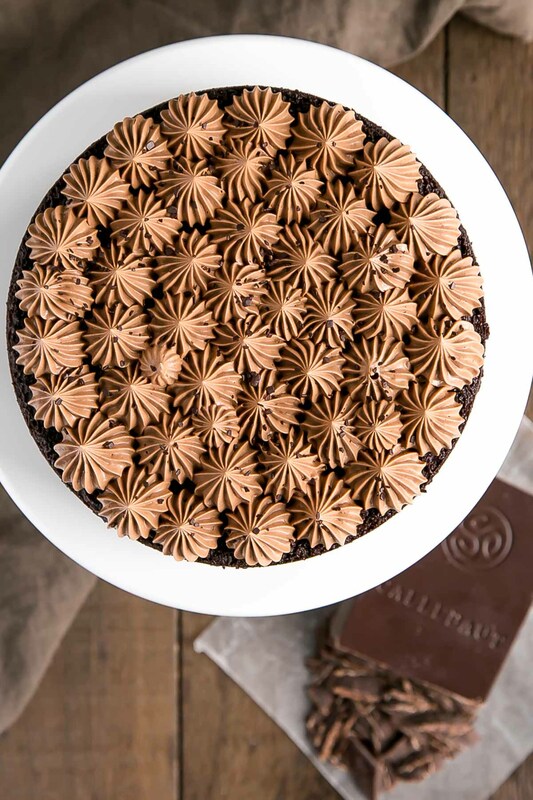 Is this your go-to chocolate cake? I really.. really LOVE your blog ! Is it best to keep the cake cold until you are ready to serve? Will the frosting turn runny if it sits at room temperature? Hi Jenna! I would definitely refrigerate it to “set” the frosting, but after that it’s totally fine out for a few hours. It will not turn runny — or at least it didn’t for me! I’m amazed at the frosting still holding its shape in the middle! It’s a sad day when you realise a cake is actually more attractive than you. Mouthwatering!! I can’t wait to try this cake! I’ve always loved the grocery store version … especially slightly frozen. SO good! for the frosting you have written 3 eggs ,,can it be white eggs only or it should be whole egg? It needs to be whole eggs. 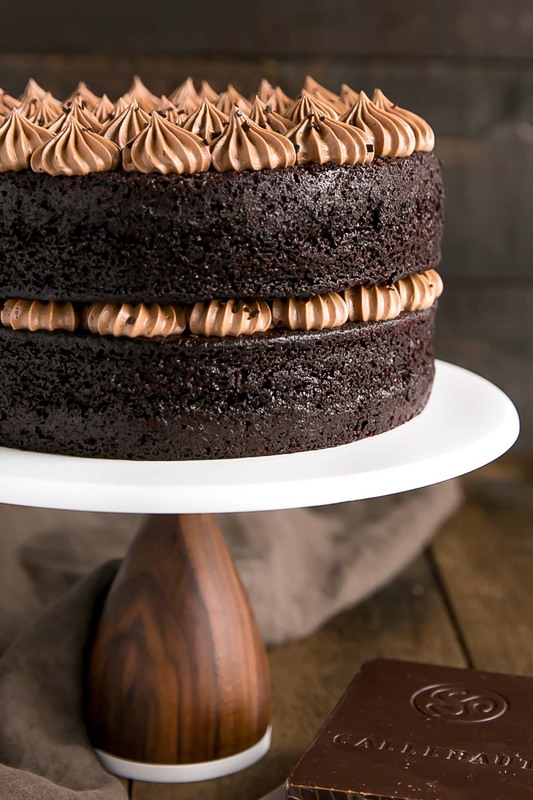 look amazing definatly giving it a try…what size of pans did you use for the cake? Thank you! I used two 8″ pans.